Dutch Prime Minister Mark Rutte recently compared the EU to a giraffe. But for the author of this Brief, our Union rather looks like an old lady (or man if you wish) with heart problems, who ignores her doctor’s recommendations and instead focuses on her fictional back pain. Needless to say that the bloc’s heart, the euro, has been under severe pressure over the past decade, including a major stroke following the excess of that Greek summer of 2015. Shocked by how close they came to a euro break-up, member states decided to bolster the common currency. The old lady Europe really became determined to take care of herself after a major accident in the UK in June 2016, where she lost her leg. Like Musketeers, EU leaders vowed to forge a “vision” for the future of Europe and its currency in Bratislava in September 2016. The celebrations of the 60th Anniversary of Rome Treaty in the Italian capital in March 2017 were the occasion to materialise that vision. Instead, leaders just signed another well-intended declaration, sufficiently vague to maintain the unity that had started to crumble after Brexit. The new deadline to reach a consensus on the way forward for the monetary union was last December. Emmanuel Macron’s victory in the French presidential elections injected new momentum in the pursuit of the long-postponed reforms. As the sun was shining, our old lady had no excuses to avoid exercise. But winter came and there was nothing to sign. The Commission made an attempt, putting forward a package that was largely ignored. As the ‘window of opportunity’ was closing, European Council President Donald Tusk decided in December to narrow down the lofty vision promised the previous year to at least a handful of proposals where consensus was close. But even if our old lady got a bit healthier getting those low hanging fruits, the major surgery she needed in her heart remained unscheduled. A fiscal union, the missing pillar of any monetary union, remains too controversial. Early this year, those in favour of deepening the eurozone insisted that results would be achieved at the June summit. Even if the boldest proposals were sidelined, this camp promised that leaders would come up with a concrete roadmap to complete the economic and monetary union. But opposition grew, Macron’s enthusiasm started to wane, and the list of priorities turned upside down with the formation of a populist government in Rome. Migration was the new game in town… again. Europe still lacked a comprehensive response to stem the influx of migrants and share the burden of asylum seekers, although three years had passed since the refugee crisis. But the volume of arrivals is today far from the record numbers seen in 2015-2016. 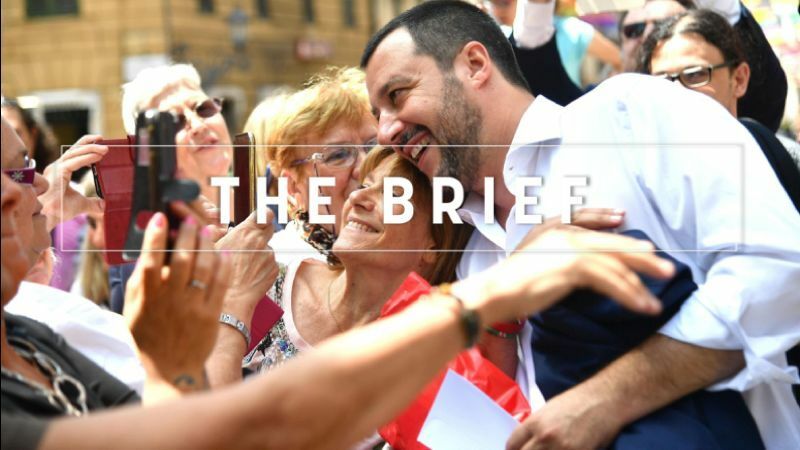 Facts are irrelevant when Europe’s anchor of stability, Angela Merkel, is caught in a mortal trap between Italy’s real helmsperson, Matteo Salvini, and her junior coalition partner CSU. In order to escape from a premature political death, Merkel has to reconcile what seemed irreconcilable. Her Bavarian partner wants to send back asylum seekers registered in Italy, and Salvini wants to redistribute them across Europe. EU leaders will try on Thursday to come up with a solution to wade out of this quagmire, by significantly reducing the number of arrivals to the continent with external centres and patrol guards. That could soften Salvini’s opposition to Merkel’s returns, and the chancellor would live to fight another day. Though Tusk admits that the number of illegal arrivals went down by 96% since October 2016, he echoed the fortress stance championed by Salvini and the hardliners. “The people of Europe expect us – and they have done for a long time now – to show determination in our actions aimed at restoring their sense of security”, he wrote in the letter sent to the leaders on Wednesday (27 June). Member states and EU officials are trying to find an acceptable formula for UNHCR and IOM to set up dubious “disembarkation platforms” beyond European shores. But Tusk wrote only “if possible”, proving that the Europeans are ready to disregard the approval of international organisations. As Europe risks putting its values at risk for solving fictional problems, the eurozone agenda continues to stall. The promised roadmap for deepening the eurozone is nowhere in the draft conclusions, despite Merkel-Macron’s deal in Meseberg. And the agreement on the backstop to resolve banks or develop the anti-crisis pot (ESM) is postponed again for December. The low hanging fruits seen last December were not so low for the aged lady Europe. Some EU officials tried to inject some importance by stressing that, for the first time in many months, leaders would take decisions on Friday when they discuss the deepening of the eurozone. But many confess that we are not where we should be. Given that Europe’s heart is at stake, nobody wants to look hopeless on the euro debate, even among those who are losing ground. But while optimism is a moral duty, hope alone is not a strategy. The European Council week is gaining pace: While German Chancellor Angela Merkel and her Spanish counterpart agreed to cooperate on migrant policy, the embattled Chancellor is also holding talks on migration to appease her coalition partners. Meanwhile, the citizens of four major EU countries overwhelmingly said they were in favour of solidarity and a joint European asylum policy for refugees, according to a poll by Avaaz. Although enlargement was high on the summit agenda, the EU puts ‘North Macedonia’ and Albania on hold until the European elections. French President Emmanuel Macron apparently searched for divine support ahead of the decisive summit and held an “intense” meeting with Pope Francis during his first official visit to the Vatican. Trade unions and employers have joined forces to urge the EU and UK to speed up Brexit negotiations ahead of tomorrow’s European Council summit. Meanwhile, Michael Emerson asks if the leadership of the country is still sane – a question some had already in mind for sure. A premiere in Luxembourg: EU ministers held the first-ever Article 7 hearing to determine the state of play in the rule of law dispute between Brussels and Poland. As the EU remained largely unconvinced, everything revolves around one crucial date. I’d like a Facebook that I pay, with full privacy, the EU’s antitrust chief, Margrethe Vestager, told EURACTIV’s Jorge Valero in an exclusive interview about her crusade against “sweetheart deals” between European governments and multinationals. The wine industry is pushing to have mandatory labelling of its products in the post-2020 Common Agricultural Policy (CAP) in order to give self-regulation a “legal basis and certainty. The patchwork of measures to fight air pollution currently in place across European cities is not only inefficient but sometimes counter-productive. There might be some thick air coming up in Berlin, as the German Bundestag is due to host a public hearing on the Commission’s proposal for cars’ CO2 emission limits. Crunchtime! Tomorrow EU leaders are gathering for the June European Council, called ‘mother of all summits’ by some. They will try to bash out a solution to the divisive issue of migration, which should help Chancellor Merkel preserve her fragile government, and lay the groundwork for a scaled-down package of eurozone reforms wanted by French President Macron. We will be right in the thick of it, live blogging (and tweeting!). A Russian businessman thinks he knows why the French soccer team got off to a winning start at the World Cup: he is supplying their hotel with cheese and yoghurt. The Hand(s) of God made a prediction that did not happen, much to the luck of Argentina. But there is one fear haunting Brussels: After a glorious win against Panama, will England’s Hurricane sweep away the Devils tomorrow? Yes, journos will be watching!